If you live in Silver Lake or Los Feliz you are lucky to have so many great places to shop, dine and enjoy life. 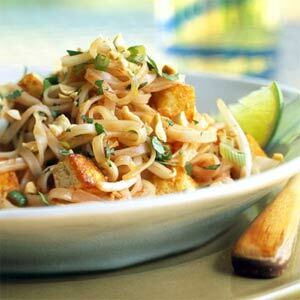 Don’t drive west for dinner, drive east to Leela Thai. Located at 1737 Silver Lake Boulevard, the branch of the boulevard that begins south of the Silver Lake Reservoir and the Silver Lake Meadow and migrates to the east of it, Leela Thai provides delicious food for a good price in an arty atmosphere. There are literally over a hundred reviews of Silver Lake's own Leela Thai on Yelp plus more on Urban Spoon. Very cool for the Silver Lake crowd to be getting noticed for good food as well as great music and indy films. Even the L.A. Times declares this Silver Lake Thai restaurant as “cheap and delicious”. 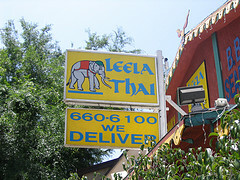 Leela Thai has had a love affair as big as an elephant with Silver Lake diners for some time. It’s the elephant you’re looking for, in fact, as you drive Silver Lake Boulevard. A bright yellow sign emblazoned with a bedecked elephant above the terra cotta-colored building lets you know that you are in for another colorful Silver Lake experience. Unlike some Thai restaurants, draped and bejeweled, Leela Thai has encouraged her patrons to create the atmosphere by leaving samples of their own doodles, art, poetry, love letters, and reviews under the glass top on each table. You might say it actually has a Silver Lake vibe! Leela Thai is vegetarian and vegan friendly, a great place for the gluten-intolerant (you can specify brown or white rice,) kid-friendly, and a stellar spot for people watching in the evenings because of the music venue, Spaceland, next door. If you’ve had enough of L.A.’s music scene and its denizens, eat lunch at Leela Thai. Order a 5.95 lunch special, and then take a stroll. Hidden amongst the auto body shops painted like canaries and Smurfs, you’ll find Silver Lake boutiques and galleries (more about that in future posts) replete with local treasures. With less than ten bucks under your belt, you’ll have money left to shop. Eat local. Shop local. In a neighborhood as great as Silver Lake, you’ll be thrilled that you did. Thanks for mentioning Leela Thai. I love that place! Only thing is, why does the title say "a great taste of India" when it's Thai food? As in from THAILAND? Just wondering. I'm not sure how I managed to say "India" when I first posted it but I caught it pretty quickly! Thai food from India may be a dfiferent thing all together! LOL!